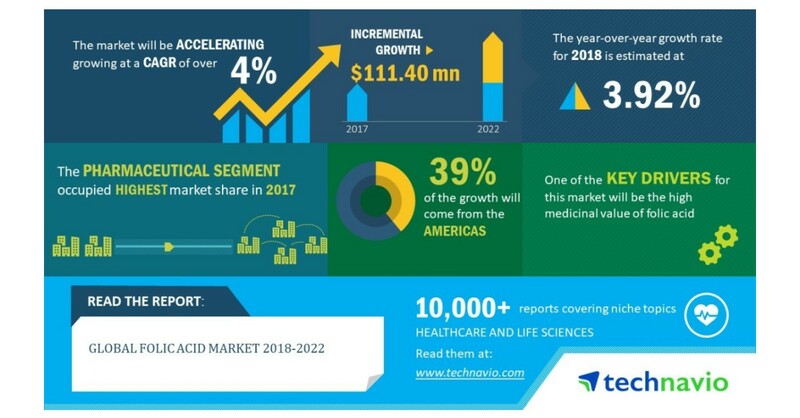 LONDON–(BUSINESS WIRE)–Technavio analysts forecast the global folic acid market to grow at a CAGR of over 4% during the forecast period, according to their latest market research report. The growing e-commerce platform is one of the major trends being witnessed in the global folic acid market 2018-2022. Online sales of vitamins increased dramatically in recent years, which was mainly due to the retailer’s efforts in improving the online shopping experience through better online education and targeted marketing. For instance, Amazon sells folic acid to the consumers in more than 50 demographic locations.